In 1957 the electrification of the line Brussels - Amsterdam was acomplished and SNCB/NMBS and NS used common EMUs on this relation. In 1963 the electrification of Brussels - Paris was completed and trains were hauled by triple-system locos of SNCB/NMBS and SNCF. Three years later the electrification of the line from Brussels to Köln/Cologne was also finished at 22. March 1966. All neighbours of Belgium use different	systems for their railroads: Belgium uses 3 kV DC, Germany is electrified with 15 kV 16.7 Hz, The Netherlands use 1.5 kV DC, and the northern part of France uses 25 kV 50 Hz. Series 16 locomotives have been derived from the series 15 units, and can use these foure different power systems. Series 16 has two subseries: 160.001-160.004 (today numbered 1601-1604) with Siemens AC/DC convertors and 160.021-160.024 (today numbered 1605-1608) with ACEC convertors. In 1974, units 1601 and	1602 have been equipped with a smaller fourth panto, to be able to haul the "Freccia del Sole" holiday-trains without changing traction to Spiez in Switzerland. The machines suffered a lot from this labourous job, so the longest rides by NMBS units were shortened to Basel in 1975 and finally abolished in 1978. On request of Märklin, a well known miniature train company, the NMBS/SNCB repainted 1601 and 1602 in the grey and blue scheme of the former EC "Memling" (Dortmund - Ostend), with a small Märklin logo. In the last years all units, except for 1607, have been being used on the connection between Ostend - Brussels - Liège - Cologne/Köln, whereas technical problems due to their age increased. 1607 was destroyed in an accident in Ostend, in the morning of 24. 2. 1994, when a train ran into the unit, parked at the end of the platform. 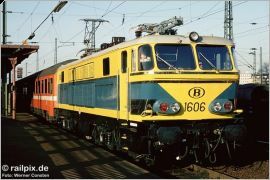 With the changed timetables in december 2002 the fast trains between Oostende and Cologne were discontinued and the future of the left seven locos of class 16 was uncertain. There have been as well discussions on usage on line Athus - Meuse (new electrified at 25 kV 50 Hz) as on haulage of IC trains Oostende - Antwerpen in sandwich traction to free several class 13. Since february 2003 some locos haul peak-time trains on relations Ostend-Schaarbeek and Brussels-Welkenraedt. Furtermore night-train "Jan Kiepura" is worked on the Belgian section by class 16. The rumours on the new class 14 locos, which can operate with 15 kV 16.7 Hz power as well as 3kV DC (and probably 25 kV) so that it can replace classes 16, 22, 23, 25 and 26 have become quite. The new loco might be similar to class 13, which doesn't usually need a 'banker' loco up the steep grade from Liège G. According to other rumours it might be a quadriple-system loco based on new DB classes (185, 189), because SNCB has drawn its conclusions from the problems of class 13.